An historical note—Jackson Park and its lagoons was created by the infamous creator of many of the United States parks, universities and other open spaces, Frederick Law Olmsted. JPYC began it’s 2nd Century Opening Day with dignitaries, Warrant Officer Ginsburg, Commander of the Wilmette and Calumet Harbor Coast Guard stations. Marine Unit M-3, Chicago Police Department; C. Scott Stevenson, Vice President of Westrec, John Willy, Jackson Park Harbor Manager. Past JPYC Commodores Stan Gratt, Dave Morrow, Steven King, Raymond Andresen, Fred Rowley, Robert Fouts, S. James Bown, Berry Miarecki, and Robert Shogren. In addition, famed around-the-world solo-circumnavigator, Bill Pinkney, the Commodore of Burnham Harbor Yacht club, Tom Petkus and Jerry Metzger, Commodore of CYA. In the JPYC Centennial Regatta, Pronto, Latest Trick, Punch, Peregrine, and Virago All posted First Places in the series of races with Perfect Lady and Annie in Seconds. James G. Webb was elevated to “Old Goat” status in the Chicago-Mackinac Race. This was his 25th time participating. Ted Graves worked with Scott Stevenson to try and improve the security of JPYC. Graves performed close and detailed monitoring, establishing a dialogue with the Chicago Police District Commander which aided invoicing our concerns over general park security and clearing the parks at the 11:00p.m. closing hour. This went a long way in improving the late night safety of the grounds. Honorary Member Captain Bill Pinkney was named to be the Captain of “The Amistad”, a reproduction of the 129-foot freedom schooner that was involved in the Amistad incident of 1839. Water depth is an issue this season. Boats with less than 5’ draft can get into JPOH; boats drawing more, will get here mast stepped for free. Paul Waltz joined JPYC in May 1999 and is our new Steward. While April 15‘” is traditionally the day most boaters mark on their calendar as the day they will launch their yachts, Jackson Parkers must wait for the another sign of spring, the annual dredging. Again this year, many of our larger boats were stranded in local boat yards while awaiting the completion of the dredging, Since this was the third year in a row that dredging was not completed in time for the opening of the harbor, JPYC has lost upwards of 18 boats from its racing fleet over the last three years as they have migrated to other harbors that can accommodate boats drawing greater than 5 feet. The good news this year is that we ﬁnally have a channel that has depths of up to 10 feet and that should be good for another few years even if water levels don't begin to rise. The late start notwithstanding, JPYC’s opening day ceremonies went off as scheduled, followed by a sumptuous brunch, and the annual Fleet Review with the appropriate martial music under the command of new Commodore, Cedric Chernick. In February of 2000, Renovations for the lower-levels headed by Pam Rice began. New floors, lockers in men and women’s washrooms, toilets and particians, sinks and showers. Bobby Mitchell, Bob Walsh, Eunice Lyle, Edith Hill, Jim Lett and Jerry Hutchinson. Dave Cox donated new furniture for the lounge area, that we still enjoy.Of course by the time the opening day rolled around, runny major improvements had already taken place. Dave Cox donated for the new wicker furniture for the downsairs lounge. Thanks to Dave Dobbs and his House Committee, the stereo system was completely reworked with new wiring and electronics and speakers, plus a CD player donated by Bill Christ. This was one of those “simple weekend projects“ that turned in to “just one more day and we’ll be done" jobs that lasted almost a week and many trips to the local hardware store. Fortunately, all of these projects were completed and ready for the club to host the Police Breakfast following the annual St. Jude Day parade. The club again provided facilities and served·150·Ofﬁcers from the local Third Police District. It was decided that during the winter doldrums, the club house remained active and open as it saw seminars on racing which included speakers from local sail lofts imparting their trim secrets to the novices and old salts alike Mike Considine from UK sails and Perry Lewis from North both put on demonstrations that provided more information than many members could absorb in one session. Additionally, seminars were also conducted by our own members on subjects ranging from navigation with a G.P.S. to diesel engine maintenance. It was the year 2000. There was much controversy with the depth of Jackson Park harbor. Vice Commodore Cedrick Chernick, and Board member Ted Graves would take an official stance with Westrec. Westrec was overwhelmed with boaters wanted to transfer to escape the “shallows”. JPYC was threatened with losing boating members, especially racers. Jackson Park Harbor water level was 14” lower. Jackson Park Yacht Club and LaRabida Children’s Hospital teamed up. LaRabida will use JPYC for small meetings and other public relations events, while their $14 million renovation takes place. Membership Chair Stan Hill was commended for his outstanding recruitment of many new members. In May of 2001 a new By-Law Amendment came into play. The proposed change was to formally establish the JPYC Racing Fleet as a standing committee under the By-Laws of the club and enumerated the purpose and scope of the committee activities. Westrec dredges JP Outer Harbor. JPYC invite all of the sailors who left during the low water, to return. JPYC celebrated our 105th Opening Day Ceremony! July 2001 — JPYC hosted LaRabida Children’s Hospital reception with special guest baseball player, Minnie Minos. JPYC enjoyed taking an annual overnight cruises to the Hammond Marina to have dinner at Phil Schmidths. Members who did not sail, drove. Eight JPYC ships raced in the 2001 Mac Race this year, Golden Dream, Mischief, Witchcraft, Providence, Latest Trick, Pronto, Tall Dog and Airwaves. Schooner “Fame” visits Jackson Park Yacht Club. The Ridge Historical Society presented a special evening with boat owner, Mike Mulcahy. Mulcahy owned the last real gaff rigged schooner in Chicago (hailing for many year from JPYC). The program featured video excerpts of film taken by former owner Ted Dunlap from1926 through 1958. A summer cruise to Racine, WI. Flotilla included Alpha Rays, Purple Reigns, Sea Horse, H2O, Simple Justice and Freelance. 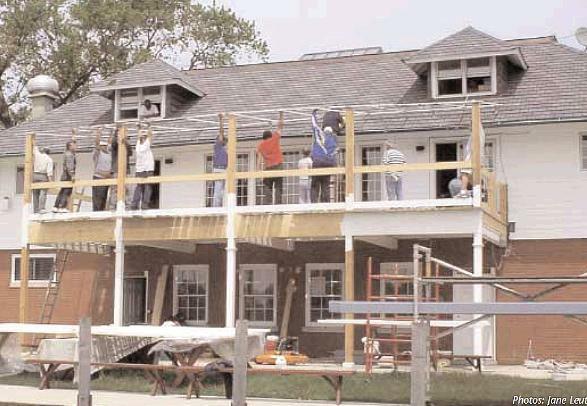 Thanks to Commodore Frank Garner, the club was able to afford the roof that overhangs the club porch. Members and skilled craftsmen Johann Hudson, head of the House Committee and Matt Clifford built the wonderful structure— In fact, the entire porch was rebuilt. There were many members to assisted in the building as well. Johann Hudson selected a beautiful carpet for the galley area which would last the club for many years. Hudson was also responsible for contracting a roofer for the club house and the Ice House with beautiful shingles and copper flashing that will last the club for years to come. We also must recognize our master electrician, Yassin Namdar. Mike Rummery for lending his skills in internet and our telephone systems. In June, David Dobbs put out a call for a club steward. 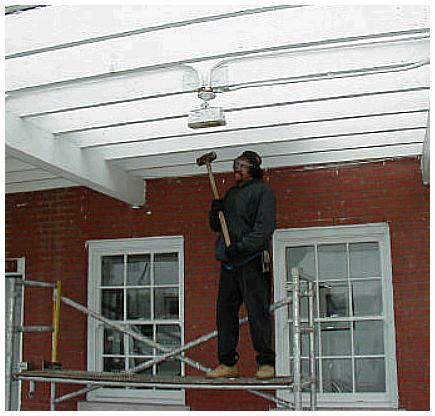 Members together were maintaining the club. Members who have never been on the scene, came out to become involved. “Quinn Mary” Kurt and Mary Olsen, took First Place in Venetian Night this year. Westrec supplies all Chicago Harbors with security. For Opening Day, Past Commodore Bob Shogren and his wife, Carol returned from Florida to help us celebrate, and assisted in the placing of the memorable wreath. MaryII scored again this year with a third place , with a “Lion King” theme and Ray Paul and his crew and Sea Scouts took first place with a theme of “Oklahoma!” with the grandly deco-rated St. BB. Last but not least was Tony Deters’ Blow Me Away, decorat-ed with a jazz theme and nicely done. The club is going to have to replace the porch deck this fall, so keep your tools ready. We also need to paint the building siding, and windows, hopefully this fall. Two big jobs,but necessary for everyone’s enjoyment of our club. The commodore of Columbia is offering to let JPYC members use their dining room, now that our galley is closed. I’ve eaten there and can tell you the food is better than great. Prices are reasonable, they will take credit cards, just let them know you’re from JPYC. Jackson Park Yacht Club enjoys close ties with La Rabida Children’s Hospital, our neighbor to the East. Club, members serve as volunteers, contribute financial support, fly the La Rabida burgee from their shrouds, provide meeting space for hospital staff, share their parking lot, and occasionally make use of the La Rabida cafeteria for well-cooked meals. Under Commodore Stanley Hill, Alpha Thompson was awarded the "Yachtsman of the Year", an award that was noted duely earned. Jackson Park Yacht Club announced it will run Match Championship Races for J-105 boats from Chicago Area Fleet 5 in effort to attract new racers and members to the club. The club purchases a new Boston Whaler from Saugatuck, MI. — "Dolores" named after the "Rentners brothers' mother. The club has been re-vamped with new ceiling, lighting and ceiling fans (selected by Mary Avellone; a new furnace was purchased. All was supervised by Johann Hudson. The EPA cracked down of boat sanitary systems. Every boat had just ten days to get certified upon arrival. Westrec and JJR presented a study of the Habor/Expansion at South Shore Cultural Center. This was calling or a development that would be east of LaRabida, with the extension of the existing breakwall. This would house 700-1100 boats with transient slips, parking and other amenities. This fell through. Jackson Park has also taken a bold step by announcing it will run a Match Championship for J-105 boats from the Chicago Area Fleet 5 in an effort to attract new racers and members to the Club. Since the dredging issues over the past years, the club has lost 30 or more racers to other harbors. Now that the water levels are up and the dredging is being done in a timely manner, its time to attract the racers back to Jackson Park. The Match Race event is novel enough to attract these racers to participate. There has never been a Match Race event for J-105 size boats in Chicago and it has been well received by the J-105 fleet. During the club's rennovation, the entire club, basically had to be re-wired. Electrician, Yassin Namdar and Johann are responsible for this extra-ordinary commitment. They have save the club thousands of dollars. The club also had to have a new furnace this winter, which Johann was responsible for supervising. All of us who have been by the club all winter have seen the welcomed transformation. Our phone system is up and running now as well, thanks to Mike Rummery. The Leutholds have donated two historic photos to be displayed in the club. Both of them depict the Santa Maria in the harbor. Providence finished 3rd in section, 7th in fleet; Latest Trick finished 7th in section; Witchcraft finished 15th in section. Wanda Robertson becomes JPYC's first female commodore. Mary Avellone is now Vice Commodore. New card readers on both club exterior doors and the ice house were installed. The new key cards will be permanent and work for as long as you are a member. A special feature at the 111th Opening Day Ceremony this year was the presentation of certificates of recognition to members of the Club for 30 or more years. The certificates were a project of Director Pam Rice. Nine senior members attended the ceremony to receive their certificates, including the newest senior member, Dennis Raske. JPYC Holds its first annual Nautical Flea Market. What a success!! Diane Jaderberg voted the "Yachtsman of the Year"